The results are in! Carnegie Mellon's Tartan Racing took the $2 million top prize, Stanford Racing—last year's winner—came in second for $1 million, and Virginia Tech rounded out the top three, pocketing $500,000. 2 PM: "Ladies and gentlemen," the race caller intones, "Junior, the first bot to see the finishing checkered flag!" With spectators standing on the bleachers, hanging over the chainlink fence, and screaming their lungs out, Junior, the Stanford Racing Team's VW Passat, crosses the finish line. After finishing its long, hard slog, the car sits still and silent in the middle of the track for a minute, as if nonplussed by its feat. A moment later, Carnegie Mellon's Boss bot zips past the finishing flag, followed closely by Virginia Tech's Odin. The three other bots on the course are still chugging away. Two years ago, when Stanford's Stanley bot was first to enter the finishers' circle, Stanford team members instantly erupted with joy and emotion, jumping into the car for a honk-filled victory lap and dumping Gatorade over the head of their fearless leader, Sebastian Thrun. There's no such revelry this time around, possibly because the results aren't so self-evident. All three teams know that final score calculations still have to be made and that the close finish means any of them could take the top prize. 1 PM: One more team has scratched—Germany's CarOLO—but the remaining six contenders are looking strong. The three current front-runners are Stanford, Virginia Tech, and Carnegie Mellon's Tartan Racing. All have completed two of the three prescribed missions, meaning they're about two-thirds done with the race. The Cornell and MIT vehicles were locked together side-to-side for several minutes, Ben Hur chariot-style, but both managed to disentangle themselves and are motoring along again. 11 AM: The "All Pause" has been lifted, and the remaining vehicles are being allowed to continue along the route—except for the team from the University of Central Florida, which has just been eliminated. It's too early to make an iron-clad assessment, but Virginia Tech and Stanford have been among the most impressive teams in the early going. Like every team, they've had glitches, including pauses and near-collisions, but have distinguished themselves in managing to shake off the problems in a reasonable amount of time. Still, most human drivers probably wouldn't feel comfortable sharing the road with them at this point. They swerve erratically at times and take many sections of the course at a snail's pace. By 9:45 AM, it's official—the field of eleven teams has already dwindled to eight. Oshkosh, AnnieWay, and Intelligent Vehicle Systems' entrants have ground to a halt, forcing them to drop out of the race. Oshkosh's demise was the most dramatic: It slammed into the side of one of the stage-set buildings in the mock urban environment. DARPA officials have declared an "All Pause," ordering the still-viable vehicles to stay put while organizers figure out how best to continue with the competition. Many spectators have been congregating near a traffic circle early in the course, since it's where a lot of the action seems to be. A mandated lane change in the vicinity has been giving some of the vehicles fits; they appear to interpret the lane change incorrectly as a turn. In the end, most manage to make the lane shift after only a slight hesitation, but car #54, from the German team AnnieWay, lingered at the intersection for several minutes, backed up, paused, and backed up again before finally finding its way to the correct lane. Meanwhile, elsewhere on the course, #26—the Team Cornell vehicle—came to an unexplained stop smack in the middle of a lane of traffic and lingered there for several minutes before sorting out the confusion and getting back underway. #21, Team Oshkosh's 24,500-pound TerraMax truck, just smacked into a barrier and shows no signs of being inclined to get underway again. "Bot 3-2 has been given permission to commence operation," the announcer booms. "Victor Tango is on the move!" At just after 8 AM Pacific time, "Odin"—the modded SUV from Virginia Tech—purrs to life, passes in front of the bleachers to give spectators an eyeful, and disappears around the corner to a chorus of cheers. Odin's competitor number has a special significance; it honors the 32 students and staff killed in the recent Virginia Tech massacre. A few seconds later, the Stanford Racing Team's "Junior" gets the go-ahead. Junior lurches and pauses for a long moment just after exiting the blocks, but then regains its composure and follows Odin onto the course. The other nine vehicles follow, spaced a few minutes apart to decrease the odds of a collision. Race-day countdown has begun—it's 7:15 AM Pacific time, and the first robot vehicles will rumble from the starting blocks in less than an hour. Despite the morning chill in Victorville, the overall mood is exuberant. Inside the big white breakfast tent, team members in matching jackets bolt down cup after cup of coffee and hunch together over folding tables to discuss strategy. Out at the track, the vehicles slated to launch first are already pulling into their starting positions. The shared feeling among team members and organizers that nothing about today's event will be predictable helps fuel the excitement. "If anyone tells you they know what's going to happen, they're lying," says Norman Whitaker, the Urban Challenge program manager. "Sometimes the robots will decide to go off on some road that we didn't even know they knew about. This is also the first chance the robots have had to interact with one another, and we're cautiously optimistic that they'll behave well together." He warns that the race could have an anticlimactic ending, since the first vehicle to complete the course will not necessarily be the winner. Finishing time will be taken into account, but points will be deducted for infractions like running stop signs and veering off the prescribed route. Flash back to October 8, 2005: Stanford Racing Team's “Stanley”—a tweaked VW Touareg with robotic innards—kicks up a cloud of triumphal dust as it crosses the finish line at the DARPA Grand Challenge in Primm, Nevada. Stanley was the first of four unmanned vehicles that day to complete a 132-mile desert course replete with rocks, treacherous inclines, and cliff-side hairpin turns. Though Stanford's team grabbed the $2 million top prize, the event represented a collective victory for autonomous vehicle developers. After Stanley and its cohorts proved their mettle, self-driving cars started to seem less like a Jetsons-inspired pipe dream and more like the automotive wave of the future. 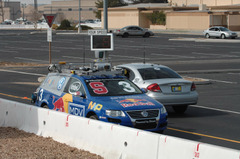 DARPA is upping the real-world ante with this year's Urban Challenge, held in Victorville, Calif. The field of 11 robotic finalists won't just need to steer, turn, and brake successfully to navigate the 60-mile course; they'll also have to obey traffic laws and signals, negotiate merges on lane-marked roads, and carry out simulated battlefield supply missions. The race organizers' immediate objectives are military—Congress has pledged to replace one-third of its operational ground fleet with autonomous vehicles by 2015—but if this year's entrants can pull off bravura performances, the civilian implications will be enormous. Robotics engineers envision a new generation of computerized cars that will redefine the term “autopilot,” ferrying passengers unassisted from point A to point B, maintaining ideal speed at all times, and braking for dogs and bikes faster than any human driver ever could. And then there were eleven. Yesterday, the Defense Advanced Research Projects Agency (DARPA) announced that it had narrowed the field for its Urban Grand Challenge to just under a dozen robotic vehicles. 35 teams were part of this week's qualifying rounds.